At times, you will see horses who lean from side to side on their front ends while being ridden under saddle. This movement is a type of "lumbering" (also called "canting"), the throwing of the front quarters over the grounded foot. This is not a natural movement and probably will not be seen in unstarted horses. However, horses who have learned to go that way under saddle, may, at times, exhibit this movement at liberty. The horse is very lateral; he may be performing a 4 beat gait, however, the leaning (lumbering) from side to side is indicative of his pacey-ness. The horse's back may be so tight or ventroflexed that his only allowable movement is lumbering. Too much ground-contact time for the weight-bearing front foot. 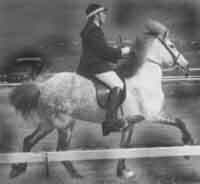 Misconception of the rider that pulling on the left rein when the right leg is in the air (or vice versa), somehow the neck gets out of the way and the foot goes further forward or higher. The horse is being pushed too soon, too fast, in his training. The horse is being pushed onto the forehand disconnecting the hindquarters. Pain, inhibiting the horse from using his hind limbs correctly. "What you are seeing and describing occurs in some Peruvian Paso horses. I know exactly what you mean. There is a spanish/peruvian word description for it, I will find out and let you know. It is one of the worst defects you can have in a Peruvian horse. When viewing the horse coming at you, it looks like the whole body of the horse is leaning first over to one side and then the other. This way of moving is frequently found in horses that are base-wide in the rear and are compensating with the swaying side to side in the front to deal with the lack of strength in the rear. 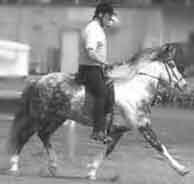 A large part of the side to side swaying movement is because the horse is actually pulling itself forward with the front leg first on one side and then the other instead of impulsing with the rear legs. Base-wide means the hind legs of the horse are set too wide apart and many times wider apart than the front legs--in some cases, if you stand directly behind the horse, you can see both front legs in the space between the rear legs. This type of horse frequently also has wide termino and an ewe neck, which produces what looks like a high head carriage (with an ewe neck, the horse cannot carry its head low, especially under saddle and in the bit), which makes it look (to some) impressive, especially when seen from the side. The reason it is considered a bad defect (aside from the obvious lack of aesthetics) is because horses that move that way are experiencing undue stress on the front end and frequently do not remain sound past early ages." The two pictures below show the horse's front end "canting" over to the left. 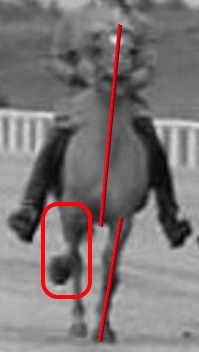 And the bottom picture shows the horse leaning to the left, with his left front leg angled into the midline, with the right front winging outside the mass of the body.